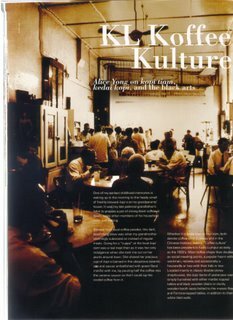 These are my first few stories out in a magazine! 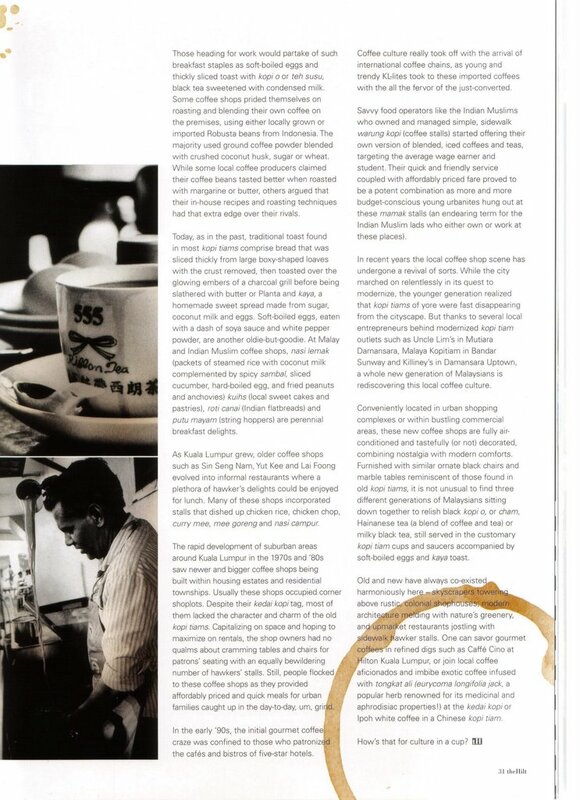 The Koffee Kulture story focuses on the coffee-drinking trend that's brewing in Kay-El (Kuala Lumpur to the uninitiated). 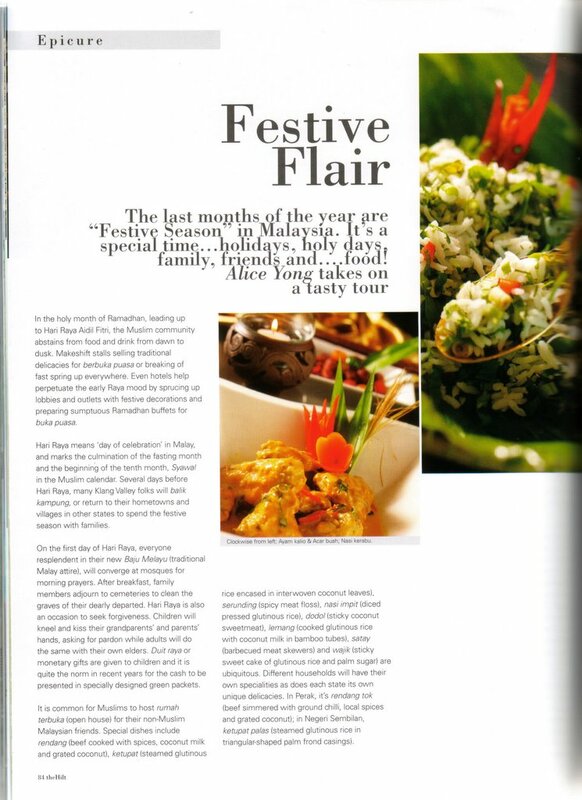 Food of course, play a prominent part in food-loving Malaysian lives as highlighted in my Festive Flair story. It also touches on the major festivals Malaysians celebrated over the last quarter of 2005 and first quarter of 2006. 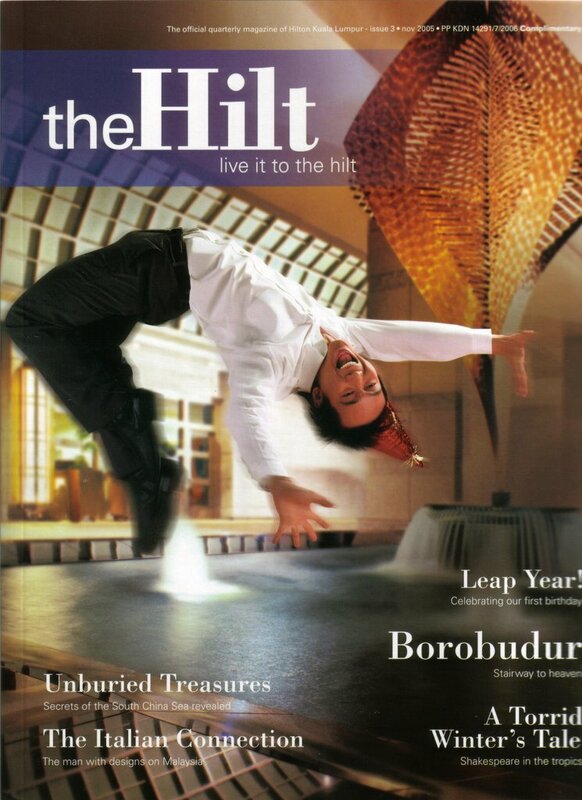 The Hilt magazine by the way, is the quarterly glossy publication of KL Hilton. So if you want to read these articles in their original glory, try and nick a copy from the hotel! Otherwise you'd have to be contented with what I have posted here. 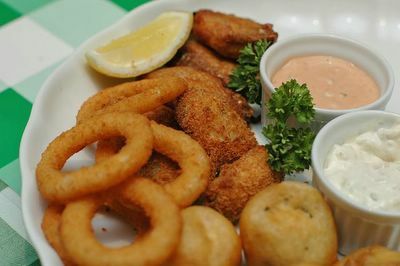 A plateful of crispy bites - chicken wings, oysters & squid rings...yummy! 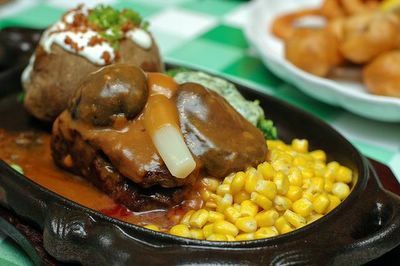 Jack’s Place is famous for its great value sizzling steaks and sumptuous cakes amongst Singaporeans for the past 40 years. Hainan Island-born Say Lip Hai came to Singapore and learnt how to cook roast beef and Yorkshire pudding for the British troops in Sembawang. His delicious meals impressed a British housewife so much, she persuaded Say to start a joint catering business at her husband, Jack Hunt’s pub in Killiney Road. 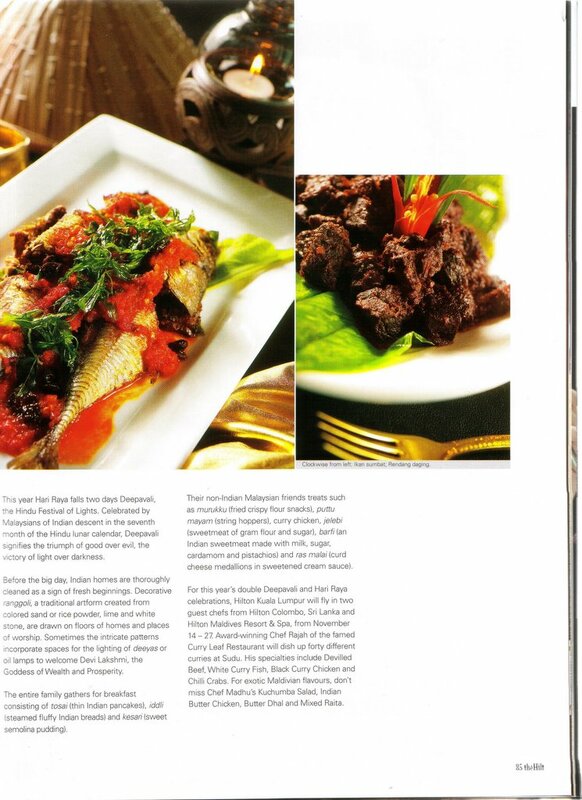 Although Jack Hunt later sold his share of the business, his namesake – Jack’s Place became synonymous for choice steaks and grilled items, salads, seafood, pizza and pasta dishes in Singapore. Now Jack’s Place is drawing in famished shoppers and local steak lovers to its inaugural Malaysian outlet at the New Wing of 1 Utama Shopping Centre. Sporting a modern, cordial ambience with sleek, earth-toned dining tables neatly set with its trademark white and green checked tablemats, attention is drawn to its wall-mounted life-size colour photos of happy customers and close-ups of its house specialities. Its extensive, family-oriented menu profers a wide selection of steaks, grilled items, seafood, salads, pizzas, pastas and dessert. You don't have to pay through the nose for a steak here as pricing is reasonable. Jack’s Place also offers pocket-friendly dining deals priced from RM13.80++ onwards. They even throw in a complimentary glass of orange juice and a scoop of ice-cream for any orders from the Kids’ Menu. The Jellicious Mango Float (RM7++ per glass), a yummy concoction of diced mango jelly in mango juice blended with vanilla ice-cream reminded us of those whimsical sundae treats dished out by old-fashioned ice-cream parlours in our childhood days. Another delightful classic that brought back great memories of our salad days is the Prawn and Mango Cocktail (RM13.50++). 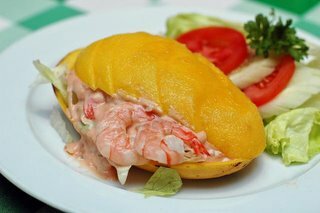 Those of you who are old enough will recall this classic salad of succulent prawns, sweet mango slices and mixed lettuce laced with Thousand Island Dressing was all the rage back in the 70s. Feeling peckish while waiting for the main courses, we ordered the Crispy Sampler Platter (RM26++) which has chicken wings, mushrooms, onion rings and oysters breaded and deep-fried. 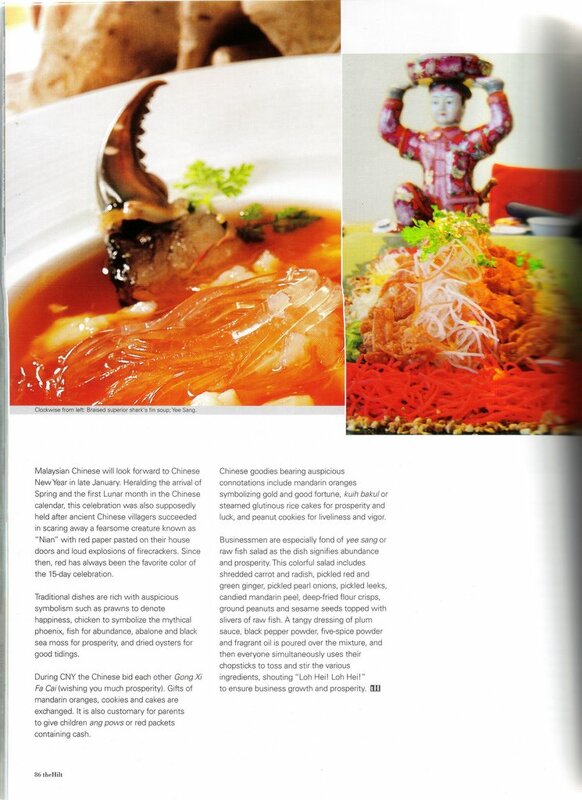 These appetizing morsels are guaranteed to quell initial hunger pangs of both adults and children. 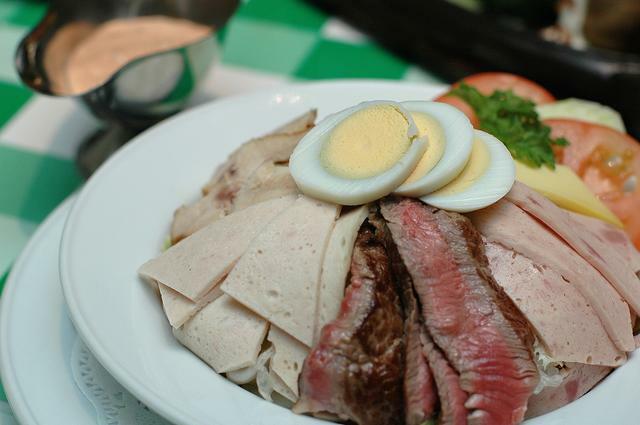 Weight-conscious diners can opt for the Jack’s Chef Salad (RM16++), a substantial portion of mixed greens with sliced turkey and chicken ham, cheese, roast chicken and beef strips. It is a wholesome, balanced meal by itself. The Jack’s Special Steak (RM39.50++) also lived up to its reputation. The succulent, juicy steak was cooked to specifications and accompanied by roast jacket potato, corn kernels, broccoli and mushroom with a choice of either black pepper, mushroom or barbecue sauce. For kids, the Chicken and Mushroom Spaghetti (RM14++) will come out tops with its enticing topping of rich, tangy and cheesy tomato sauce, and diced boneless chicken. We passed on dessert but the outlet’s famous Mango Mousse Cake looks extremely tempting! Needless to say we intend to return real soon for a slice of the action. The only innocuous flaw that marred our experience somewhat was the dissatisfactory level of its service staff’s personal hygiene. Freshness of staff uniforms and personal grooming of frontliners (especially body odour) should be dealt with seriously as these factors can break customers’ dining experience!